When I was younger, I used to work as a camp counselor. I always found it interesting to ask children what they wanted to be when they grew up, mostly because the question elicited so many original (and occasionally comical) responses: an ice cream man, a rock star, a princess, a doctor, a teacher, a painter, an actor. I was amazed by the amount of responses I received that dealt with professions in the arts. Take a “rock star,” for instance. I know many teens that have followed their passions and started their own bands, practicing out of their garages and booking local gigs. I think it is fabulous that teens today are so involved with music. It was clear that Springfield’s musical career had taken off by the time he recorded and released “Speak to the Sky.” At this point in his life, Springfield had moved to the United States. “Speak to the Sky” was his debut single at age 22; it became a hit. We all know what happened from there: Springfield went on to write and record more and more music that topped the charts. Springfield has released 17 top 40 singles throughout his music career. In 1982, he won a Grammy for Best Male Vocal Performance for the song “Jessie’s Girl.” Other hits include “Affair of the Heart,” “Love Somebody,” and “Don’t Talk to Strangers.” Springfield also branched out into acting and appeared in General Hospital. He most recently made appearances on Californication and Hawaii Five-0. See Rick Springfield live on Sunday, July 10 at 7pm. The beginning of November was a busy time for the State Theatre’s Education Department. From school shows to the Free Milk & Cookies events, we had every age group attending one of our events. It started with two school day performances of Leo Lionni’s Swimmy, Frederick, and Inch by Inch on Monday, November 1st. Over 2,000 preK-3rd graders attended the performances and teachers and students alike had a blast. We even got a chance to take some new pictures of the students in the audience! That Monday also marked the beginning of the STREB residency with the high school students at Emily Fisher Charter School in Trenton. Each Monday in November, three teaching artists from the company will visit the high school. I got to watch as they used the 90 minute workshop to introduce the students to Pop Action and begin choreographing the piece that the students will be performing at Crossroads Theatre on December 4th. This was also my third annual visit to the NJEA teacher’s convention – held every year in Atlantic City. Together with representatives from American Repertory Ballet,Crossroads Theatre, George Street Playhouse, and the Zimmerli Art Museum, I was able to talk to teachers at the convention about all the different programs each of our organizations has. It’s always a fun trip (and shopping in the outlet stores isn’t bad either!). Over the weekend, the Education Department also had some of our free Milk & Cookies events for children ages 3 to 8. Cookies were donated by the sisters of the Rutgers University chapter of Kappa Phi Lambda and some sisters from Sigma Lambda Upsilon were in attendance to help run the event. There’s nothing cuter than little kids lining up for their milk and cookies after listening to stories and songs by our storyteller, Ken Galipeau. On Sunday, we were treated to a performance by the BBC Concert Orchestra. Before the performance, we held a Scientists Exploring the Arts event in the Heldrich Room of the State Theatre and welcomed back Pre-Performance Insights. The Education Department rounded out our busy week with three performances of Jason and the Argonauts in Crossroads Theatre, brought to us by Visible Fictions out of Scotland. It was a hectic week, but I think it’s safe to say that each of these events was enjoyed by everyone who attended, and by myself most of all! As you can see, the Education Department always has something going on! Even before I knew Penn & Teller, I KNEW Penn & Teller: They have always kind of just been there, floating around somewhere in the entertainment and pop culture world. Instantly, upon finding out about who they actually are, a liking occurs. Everyone needs a little magic in their lives and theirs is best suited for those of us in suits. An escape from the 9-5? Maybe. An entertaining show that you won’t take your eyes off? Always. Don’t know what to expect: knife flinging, bullet catching, and trapeze swinging fun! 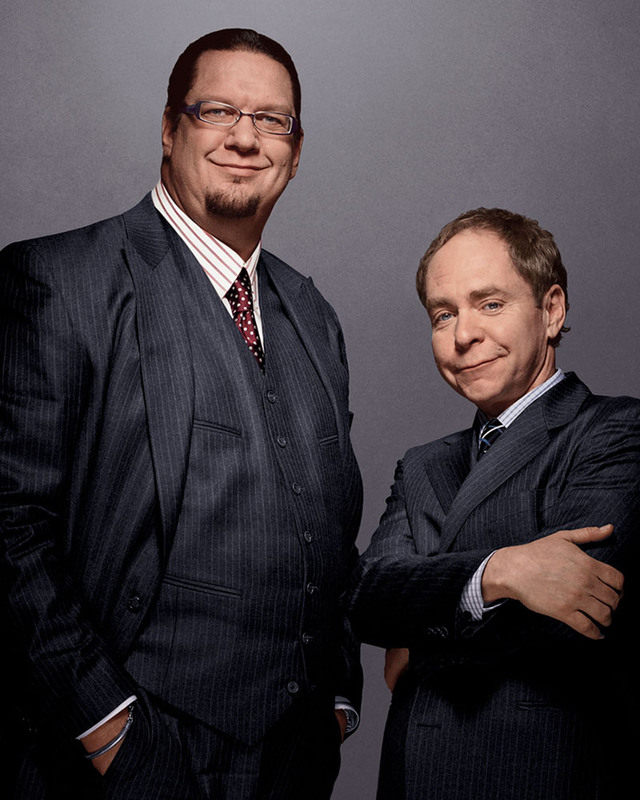 Penn & Teller do not really follow the same routine to say the least. Don’t miss your chance to see their return to the State Theatre on November 4th! For ticketing information call 732-246-7469 or go to http://www.statetheatrenj.org/penn_and_teller . For many people, listening to a choir concert might not sound like a fun way to spend an afternoon. However, The Crossing is attempting to change the way people think about choirs. Founded in 2005, the choir is unique because they sing newly composed and modern music. The Philadelphia Inquirer has called them “Philadelphia’s Best Chorus,” and said “most of the music presented by Donald Nally’s choir, The Crossing, lies outside describable musical contexts”. This is what makes the choir so exciting. This summer, during their “Month of Moderns” concert series, the choir presented three premieres on words of Pulitzer Prize-winning poet Phillip Levine: Statement to the Court by Pulitzer Prize-winning composer David Lang; The Memory of Rain by Lansing McLoskey; and Breath by Paul Fowler. I was struck by how well The Crossing crafted a start to finish experience for the audience member. The concert program included some of the most unique program notes I have encountered, and I enjoyed being guided by them. I especially liked the special note for each piece, explaining how the choir came to find it. Following the concert, the entire audience was invited to an elegant, free reception that featured the opportunity to mingle with the choir members and fellow concert goers. This provided a lovely bookend to the beautiful music that came before. Surprisingly, The Crossing’s administration, marketing, and outreach services are entirely donated. This allows them to focus all of their funds on creating and maintaining an excellent artistic product. However, as you can imagine, it provides unique challenges to the organization and requires innovation and creativity in order to succeed. It was inspiring to see how much they have already been able accomplish. One of their marketing tactics that impressed me was being given a free CD of tracks and clips from previous concerts as a gesture of goodwill for joining the choir’s mailing list. They simply asked that after listening (or importing the tracks into iTunes!) I pass the CD onto someone who is unfamiliar with The Crossing. For more information on the residency program or on Glenis Redmond’s visit : http://www.statetheatrenj.org/education/artistresidencies.asp. And a big thank you to The Horizon Foundation for New Jersey and The Geraldine R. Dodge Foundation for their support of this wonderful program. It’s a Pajama Jammy Jam! Children’s music superstars and NOGGIN channel favorites Laurie Berkner, Susie Lampert, Adam Bernstein, and Bob Golden (Also known as The Laurie Berkner Band) will perform a “Pajama Party” concert at the State Theatre on September 13 to benefit The Pajama Program which provides new pajamas for children entering foster care. In addition to wearing pajamas to the concert, families are also encouraged to bring a pair of new children’s pajamas and/or a new children’s book to donate to the program. Laurie, Susie, Adam, and Bob are throwing a Pajama Party Concert! Kids, wear your pajamas (parents can too) or bring your favorite stuffed animal (for your head of course) to the concert. At the concert we’re collecting new pajamas and books for children in need in the U.S. and around the world, (many of whom are waiting to be adopted.) At the concert there will be a collection bin for your donations. Those not attending the concert, are also encouraged to drop off their pajama/book donations to the State Theatre Ticket Office on September 13. So, come out and support a good cause! You are currently browsing the archives for the Live performance category.